Thank you for all your bun and cake contributions. We raised £210 for this worthy cause. It was lovely to see so many of you at our Harvest Festival. Thank you for all your food contributions. We are sending our food parcels to Rush House, a local charity for homeless young people. 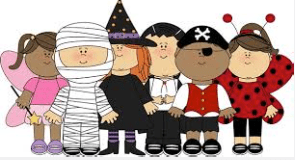 Halloween Disco – Thursday, 3rd November from 3:00pm to 4:30pm. This is for children from Y1 to Y6 (no Foundation). Children may come in fancy dress if they would like to. Children need to leave or be collected from school at the normal time, so staff have time to finish setting up the hall. Children will be readmitted via the school hall. The cost is £1.50 and this will include a drink and snack. When the disco finishes it will be dark, so we would prefer you to collect your child or make arrangements for them to walk home with others. Children in Y1 and Y2 must be collected by an adult. On Friday 18th November, we would like children to come dressed in spots / non uniform and bring a contribution of 50p which we can send to the charity. This is an opportunity to discuss how your child has settled into their new class and their progress. Please note this will be by appointment. More information about this will be sent after the holiday.